Im not the most experienced drinker of beers brewed with rye. So when I found this on the shelf of a local off licence, I thought I’d give it a go. And I’ve got to be honest, I’m happy I did. Siren Craft Brew is based in Berkshire Uk and specialise in artisinal craft beers, aiming to encourage people to look at beer in a different way. Creating different and innovative beer using all different kinds of ingredients, including INSECT beer!!!!!! Which is soon to be bottled. Must look out for that one. 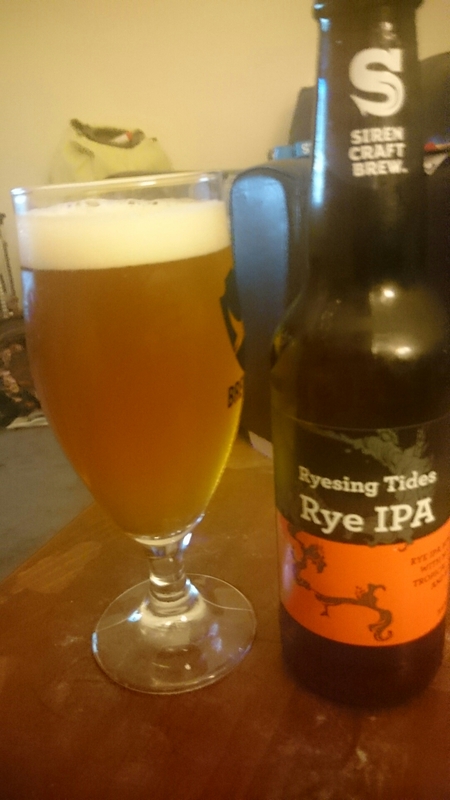 This rye ipa pours a gorgeous amber/orange colour and has a fantastic tropical citrus hop aroma. The rye is subtle on nose, imparting a light toasty aroma hiding behind the hop bouquet. The head was nice and thick suggesting a nice medium mouth feel. This beer is 7.4%abv and is a fabulous balance of malt and hops. It’s dangerously drinkable as the high alcohol is masked by the delicious malty, toasty toffee flavoured sweetness. The hops engulf the pallet and are vibrant with tropical passion fruit, pinapple and grapefruity citrus. Theres a good level of bitterness at the end which drys the pallet leaving you ready for your next thirst quenching sip. If I’m honest. Im not too sure what the rye brings to the party. Its very subtle and you can taste the toastiness and the subtle dryness it brings to the party. It certainly does nothing to harm the drinking experience, yet doesn’t exactly elevate anymore either. Never the less this is a great tasting IPA and one I can highly reccomend.